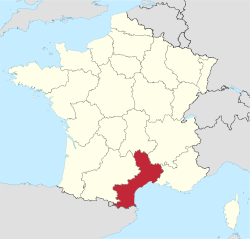 Languedoc-Roussillon (French pronunciation: ​[lɑ̃g.dɔk.ʁu.si.jɔ̃]; Occitan: Lengadòc-Rosselhon; Catalan: Llenguadoc-Rosselló) is ane o the umwhile 27 regions o Fraunce. It comprises five depairtments, an borders the ither French regions o Provence-Alpes-Côte d'Azur, Rhône-Alpes, Auvergne, Midi-Pyrénées on the one side, an Spain, Andorrae an the Mediterranean Sea on the ither side. Wikimedia Commons haes media relatit tae Languedoc-Roussillon. This page wis last eeditit on 7 Februar 2017, at 16:17.